We have a great opportunity for Freelance Dynamics 365 F&O Presales trainers worldwide to deliver training workshops and/or write training course content on a very flexible basis. We are currently looking for Dynamics 365 F&O Presales Consultants. 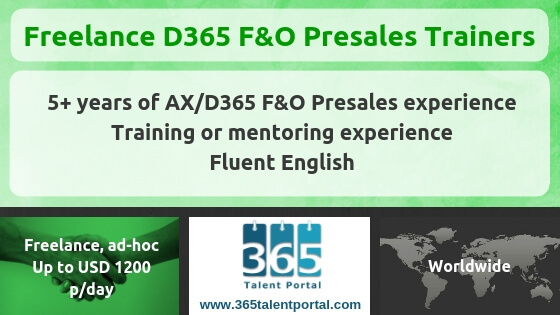 Successful candidates will regularly be offered opportunities to deliver ad-hoc Dynamics 365 F&O Presales training courses. We also regularly get requests for Dynamics 365 F&O Presales training content creation, so if that’s something you want to explore, you may get a chance to do this too.